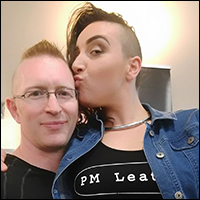 In Episode 34 of the Our Kink Podcast, MisKnickers catches up with Peter Martin and Dani Natale from PM Leather to talk about PM Leather, and how they have grown to be much more than a supplier of quality leather hobble belts. Hear about the history and growth of PM Leather, and the remarkable ability both Peter and Dani to reach people via social media. And of course, they share their plans for Oz Kink Fest, and the wonder that is Fetish Expo. We also catch up with ProDom/me, rope artist, rock star, and recent Our Kink Sponsor, Sai Jaiden Lillith, who gives us a sneak peak into some of the shenanigans they hope to encourage with performances and presentations throughout Oz Kink Fest. Listen in to find out what they’re bringing to the party this year, and why they’re so glad to be back. And of course, we have another giveaway for subscribers… This time a double pass to Hellfire Resurrection – Friday September 21st. Where is Hellfire Resurrection being held in 2018? Entries close Sunday night at 6pm. Please only enter if you can definitely use the pass.